Police have been placing sack-like hoods over detainees to prevent them from spitting on officers, but critics say the practice can be traumatizing and should be banned. 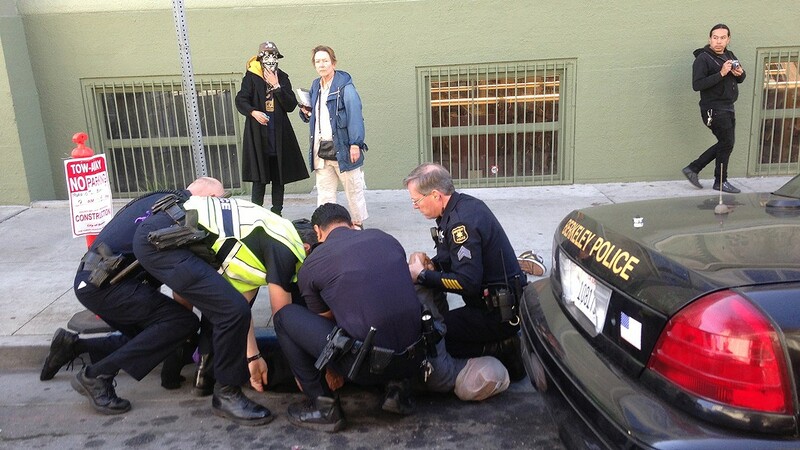 Berkeley police controlling a detainee with a spit hood on March 13, 2013. Four observers from a police reform group gathered around a screen at Grassroots House in downtown Berkeley in November. They watched footage of three officers detaining a suspect at Telegraph Avenue and Dwight Way. The footage shows police have the man on the ground, his arms bent up behind his back with an officer's knees pinning the suspect's calves to the floor. An officer has already placed a mesh "spit hood" on the suspect who is subdued and limp. "This is hard to watch," said Jathan Gurr of Berkeley Copwatch, an activist watchdog group, referring to the footage from the 2009 incident. Spit hoods are one of the Berkeley Police Department's least known, but most controversial tools. They're sack-like hoods that police place over the heads of non-compliant suspects to prevent them from spitting at officers. Spit hoods are intended to protect against the spread of communicable diseases and have long been used in Berkeley and are now widely used in other police departments around the country. Berkeley PD is in the process of updating its policies on spit hoods, and the city's Police Review Commission is reviewing their use and whether BPD should discontinue them. The department's Policy 302, which governs handcuffs and restraints — and includes spit hoods — is under scrutiny, but BPD does not keep data on how frequently its officers deploy spit hoods. "I think most people walking around in Berkeley have no idea there are spit hoods in use," Gurr said. Spit hoods are one of several tactics being reviewed as the Berkeley Police Department transitions to using Lexipol, a centralized framework that offers departments a list of best practices guidelines that BPD can then "review and tweak" to meet its needs, said BPD spokesperson Byron White. Other policies under review include the use of canines, but some say spit hoods may be the most controversial. Police say spit hoods are an essential de-escalation tool, particularly for officers. "It's a real threat ... the reaction of any person who has someone spit in their face is to retaliate or react in some way," said Sgt. Spencer Fomby, a use-of-force instructor for the department and proponent of tactical de-escalation. "Officers clearly cannot use force, so to manage that we use the hood." Police do not consider the hood to be a use of force. "Putting a mesh hood over somebody has a very low risk of injury," Fomby said. "It's not a forceful act." However, BPD doesn't track its use of spit hoods, so it's difficult to know if officers have been misusing the tactic, especially on detainees who have mental or psychological issues. BPD has narrow criteria for when to use the hoods — when a suspect is noncompliant, combative, resistant, and starting to spit, then the hood can justifiably be used, Fomby said. However, some witness evidence suggests officers sometimes overstep the mark. Tracie DeAngelis is a former copwatcher, who on a coffee break on March 13, 2013, witnessed a detainee being controlled with a spit hood outside Berkeley Public Library. "I remember hearing some loud screaming," she said. "So, I walked across the street ... [the suspect] was apologetic, pleading, begging — you could tell he was scared." Her footage shows six officers applying "the wrap" — a full-body restrictive tie. "I'm sorry! I'm sorry," the suspect cries through the hood as he is held face-down on the road surface. "They don't see that as a use of force?" said DeAngelis, who now works in human resources for the East Bay Regional Park District. "To me it is — it's an act against someone's dignity, which to me is an act of violence." DeAngelis would like to see an outright ban on the use of spit hoods. And she said that police should be responsible for protecting themselves. Gurr conceded that police sometimes may need to use a spit hood — but only in rare circumstances. "There's probably an occasion to use something like that," he said. "I just don't trust Berkeley Police to know when that occasion is." Fomby said detainees who are spit hooded often receive medical attention, and so, he argued, the masks are an important protection for paramedics, nurses, and other people with whom the suspects come into contact. "I want to emphasize it's not just officer safety," he added. Spit hoods are not new. Fomby said he has seen them in use throughout his 18-year career. They are not just used by police — other agencies use them, and they are commonly issued to medical services. On Oct. 24, the Berkeley Fire Department used a spit hood on a detainee at Civic Center Park before he was taken for psychological evaluation, Fomby said. "The main argument is about optics — the way it looks," Fomby added. "But the balance of public safety outweighs the optics in this situation." Fomby also asserted that BPD's use of spit hoods is "very rare." He said he remembers them being used "a couple times" in the past few months, though did not want to speculate on how often they are used by the force at large. "'Very rarely' might mean twice a week," Gurr countered. Without statistics available, the issue is a matter of one person's word versus another. For its part, the Berkeley Police Commission plans to compare the new Lexipol policies to the general orders that BPD has used. Sahana Matthews, chair of the commission, said the group has not yet taken a specific stance on spit hoods. "The PRC will be reviewing this policy and deciding whether or not to recommend to the BPD to ban or change the use of spit hoods," she said. Some on the nine-member commission have already made up their minds, including Andrea Prichett, who is also the co-founder of Copwatch. "I'm alarmed they use them at all," she said. She believes the hoods can make it harder to monitor vital signs. For suspects who are affected by mental health issues, she said, the process can be especially traumatizing. But George Perezvelez, chair of the Lexipol subcommittee within the Police Review Commission, believes police should have the power to use spit hoods. "No police officer in Berkeley should be subject to being bitten or spat on," he said. However, Perezvelez said he wants to see "a clear dictate" given to local police on the exact parameters around using spit hoods. "Let's be clear on how they can be used, why they can be used, and when they can be used," he said. "But at the same time, I understand the concern about how often they are used, what triggers their use, and if there's a possibility to track how often they're used," Perezvelez added. He would like to see more concrete data. "It would be a good idea for the department to supply statistics," he said. "It's accountability — right? And it's transparency." Although the commission will turn over its recommendations to the police department, it has only an advisory role in the city. Matthews said BPD is working with the PRC on Lexipol, but she conceded that police have no obligation to listen. Prichett is exasperated with the dynamic. "What would be really awesome would be if PRC could change the policy itself," she said. "They can change the policy, but the police don't have to listen to that." Ultimately, with no available quantitative data and reliance on anecdotal accounts from a handful of sources, taking informed action is difficult.